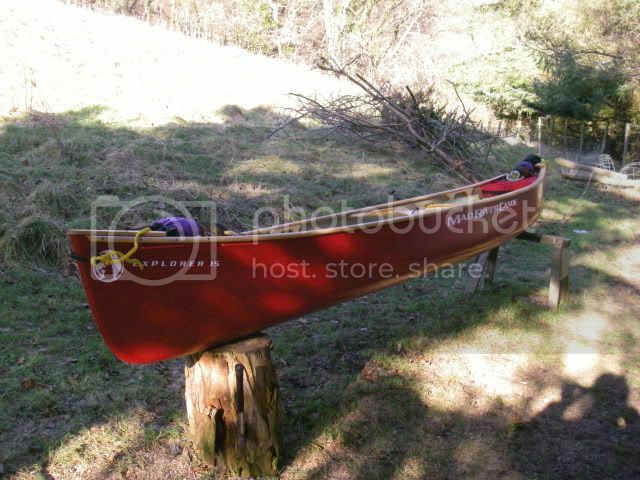 This is a great versatile canoe. great for 1 or 2 and can be loaded up for a mini exped! Last edited by MagiKelly; 22nd-July-2010 at 12:58 PM. I like the lines of the Ex15 better than I do the Ex16. Has looked to me like a great pocket tandem and a practical solo. Ted, those are nice shots. Maybe too many of the portaging, though. i've got the Intrigue 15. I've won the Durham to Finchale race with it 4 times-a great boat!! Explorer 15 Rx fitted ,drilled and laced,solid blocks and deep dish thwart fitted. 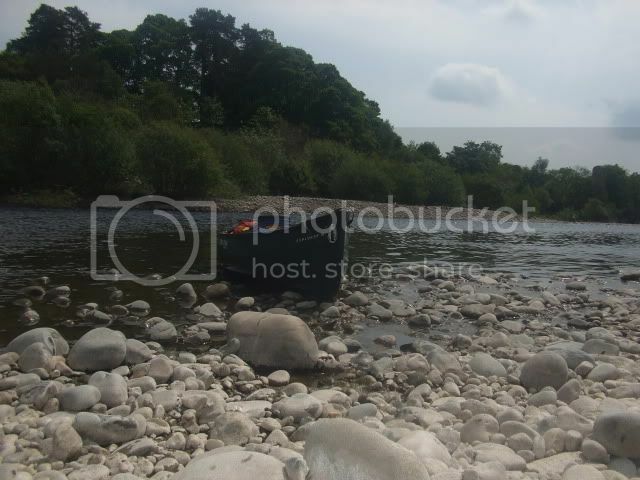 Ready for tomorrows moving water course at Llandysul paddlers. Last edited by Magic Rat; 28th-January-2011 at 05:16 PM. Just ordered one of these - due in 10 days. Very excited. The wooden gunwhales are so much better looking than the IQ2 system. Did it come like that or did you fit? If the latter, where from, how much and could/ should I do it to mine? Came like that,got it from WWCC in Carmarthen. I had a good deal on it as they were changing over to a Gatz dealership. Maybe worth a call,or Endless River have some seconds in a decent prices. The first time its used its marked anyway! You could do it to yours,people here have done it,have a search. Apache seems to be the place to sort Ash gunnel's from. Wood requires a bit more maintenance/kept under cover (in the Welsh climate anyway). I give them a sand down in the worn areas and a wipe over with Danish oil only takes 5 min. V pleased with them,much nicer than plastic. Sorry to digress but how do you find that saddle Bob H ? I've been looking at the Aguille Alpine saddle for a while but haven't heard any feedback on them from anyone. Does it slide around in the boat much or is it fairly secure because I find their kneeling mat moves a bit when using it with a kneeling thwart? I don't use it in the Explorer,as i found it moved when shifting around on moving water. I fitted a K/T now . Its used in the Mega though,fine for tripping it does not cramp my ankles as much as a KT. That's interesting. I have real issues with ankle pain when kneeling (although raising the height of my kneeling thwart has helped a lot) which is why I'm always interested in alternatives. Possibly the movement issue could be solved with some velcro stuck to the bottom of the boat without losing the flexibility of having a loose moveable saddle. I may have to ponder this a bit. On that saddle, the first step is to find exactly where it should go, fore<>aft, for best trim and performance. Next, add a thwart right where it will pass over that high portion of the saddle at its back end. Third, put a d-ring just in front of the saddle and neatly contact cement to the front of the seat so that the seat front can be strapped down to the d-ring. Fourth, contact cement some low (2" high) minicell segments to the floor of the boat, up against the seat, but don't glue the seat in. Between the front strap, the new thwart, and the glued wedges, the seat will stay put. *But* you can take it out whenever you want. Wait, there's more. You can widen the seat by glueing 1" or 2" slabs of minicell to the sides, using contact cement. What this does is that you can switch to sitting by just swinging your legs forward. I *think* the portage yoke will not interfere with your legs in a sitting position, as long as you splay your knees toward the sides. If you are lucky, you may be able to brace your legs (sitting position) against the sides and against the underside of the yoke. Some padding on the underside of the yoke might be nice. Oh, and ankle blocks next to the seat might be good for kneeling comfort. Picked mine up today. No chance of a proper paddle today, only had a demo paddle so far. Will post impressions later when I've had the chance to fully evaluate it. 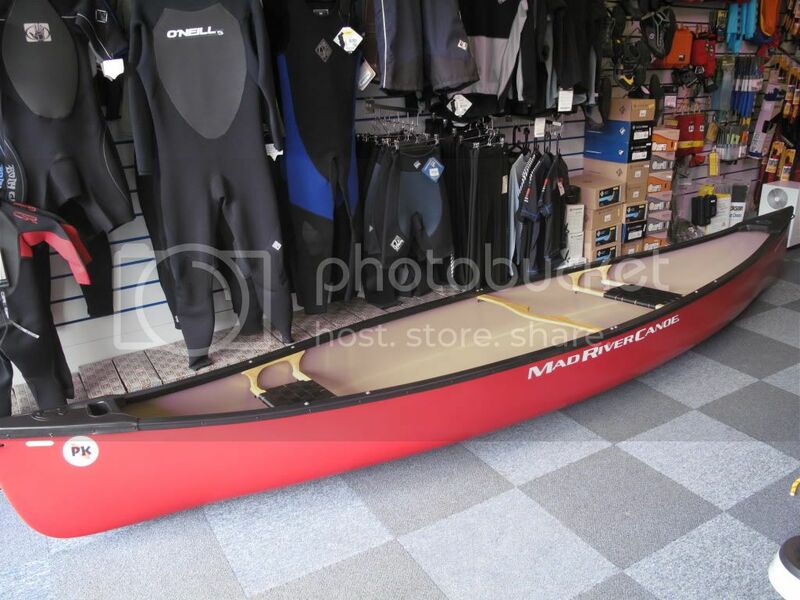 I've bought it predominantly for moving water as it's shorter than my other boats, but I hope it will be a good all rounder as well. It felt nice and stable when I demoed it, tracking seemed good and I could heel it over fine when kneeling . I also demoed the Legend 15 and I could see why the WW boys like them, but for me, this one felt better. 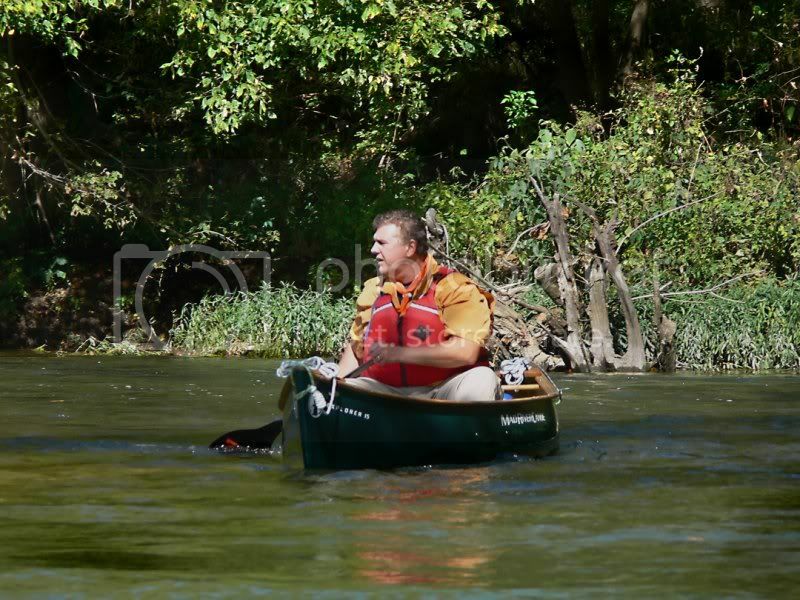 The other boat I considered was a Wenonah P15. a boat I like on moving water, but I felt that the Explorer won't catch the wind quite so bad. Other first impressions; not as well built or as stiff as my other boats or the Wenonah P15. Yoke looks crap, but it does have normal gunnels which I prefer to the IQ variety that were on the demo boat. As for the rest, time will tell. 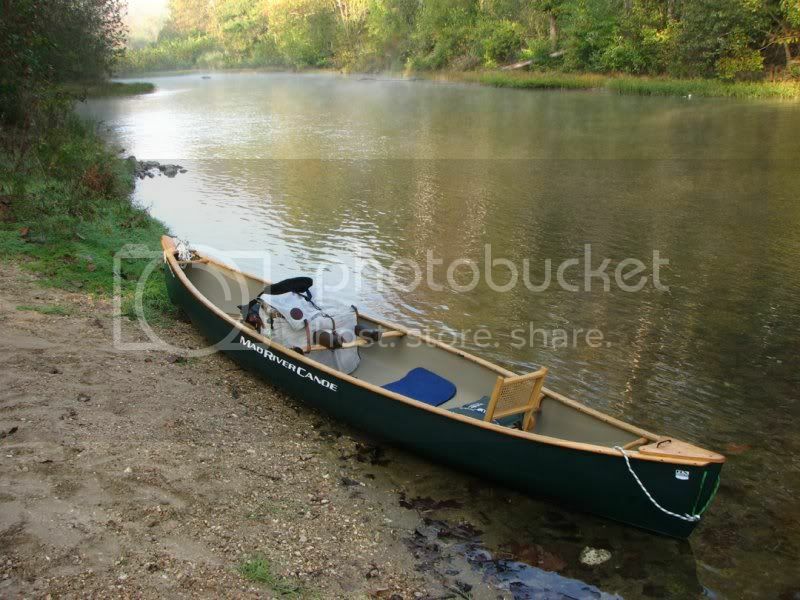 That is a very nice canoe Old Man.Thinking about getting one myself. 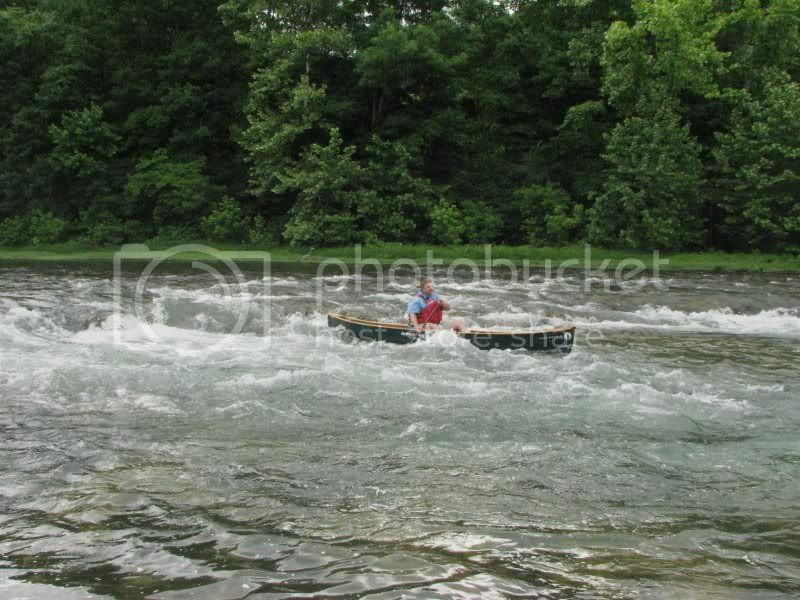 Ill bet you cant wait to get on the water. Yes, gutted I couldn't get on the water today. Will have to wait until next week now. There's one for sale on E-bay at the moment in Porthcawl with a buy it now price of £809. That's a fair saving on a new one and it looks to be in excellent condition. Sweet! I have a couple of river trips planned so I hope you can join us in it! Would love to if I'm free. Nothing too technical please, I've been falling in a bit lately !! No worries! We have a couple of options! I think you'll like it. Sold mine to a buddy as I was looking for something lighter and a bit easier to solo. Bought an old, kevlar Mad River Courier with the funds. It's one of those boats I'll always have have fond memories of! EZ Water said he thought it was a good "Pocket tandem," and he is correct. Served us well on tandem day trips and many solo river trips. When my wife started soloing exclusively, I rigged it up solo. Enjoy it, it's a good hull! I do like it with the wooden gunnels, but it's silly money to have then added over here. I like the armchair too. 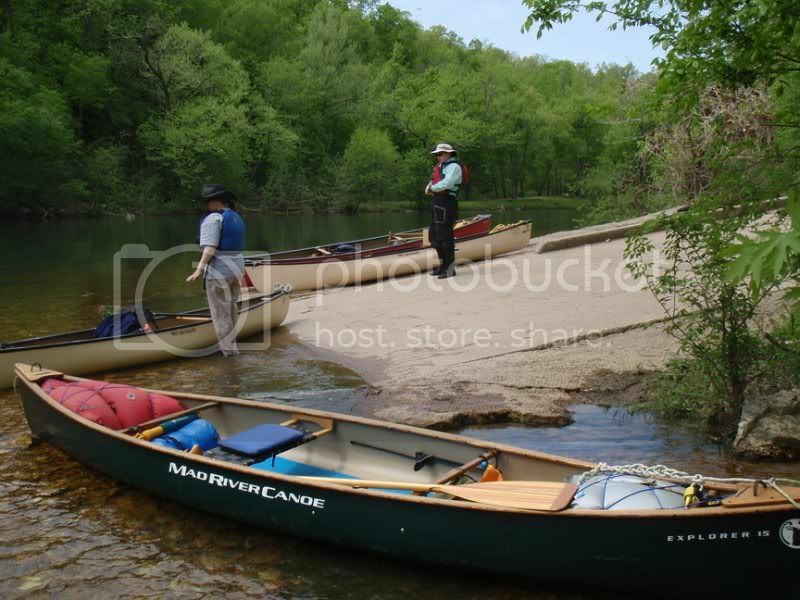 Sorry to go off-topic, but what are those white Wenonah canoes in the background ? As for the wooden gunnels, Old man, that's what was in stock. But they looked soooooo good! Took the new boat out yesterday for the first time. It was a beautiful day on flat water with no wind at all, so these comments are not definitive. I like its feeling of stability, I could change position i.e. sitting to kneeling, without the feeling I'm going to fall out. Easy to manouevre compared to my 16' boats. Glides along quite nicely but not as well as my Mega, and not as fast. Paddled 10.5 miles in it and was absolutely knackered at the end. I think if I'd been in the Mega, I wouldn't have been quite so tired in the same conditions. 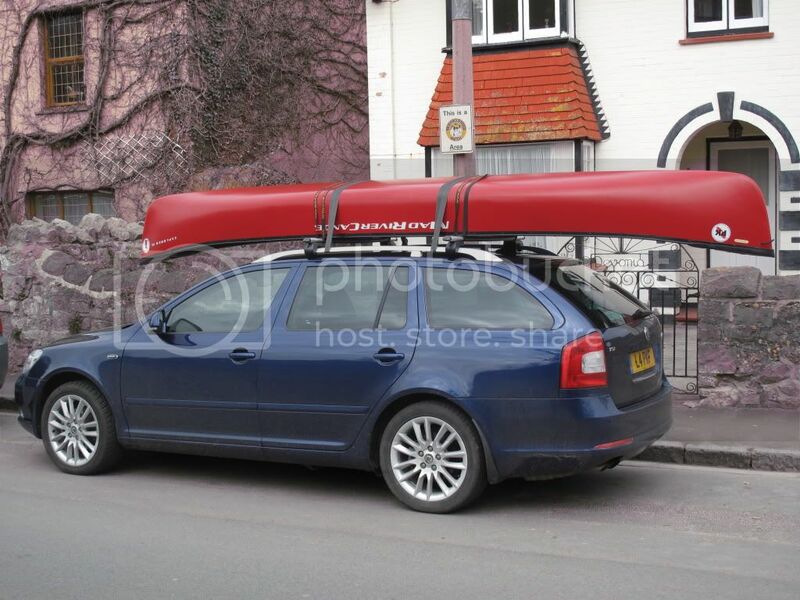 However, I didn't buy it predominantly for flat water and so far I'm happy as Larry with it. I'll add further comments when I've had it on some decent flowing water and/or windy conditions. 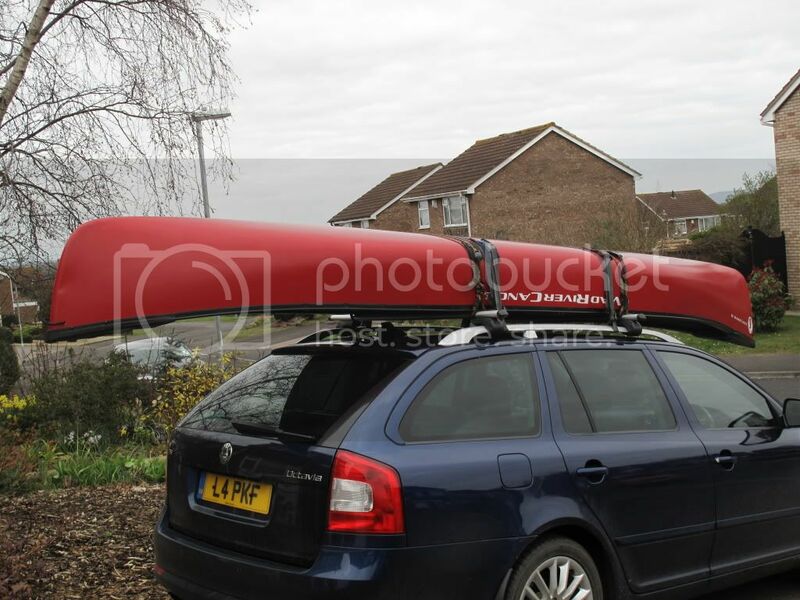 As an aside, I cannot car top this boat in the same fashion as my others so I've had to learn another method, which is what a lot of other people normally do I think, which is to shoulder it using the yoke, level it up and then slide it from my shoulders across onto my roof bars. My point is that it's light enough to do this and isn't hard to learn, so again, I'm pleased. NB. this method might not work for people of smaller stature and less strength. wonder if we will see a Mega in the classifieds soon! Not likely unless I get pushed for cash. I believe it would have been the better boat. Different boats for different strokes. My wife tells me I'm a lucky guy to have more than one canoe and she's absolutely right - I am. If I had to choose just one of my boats as the best all rounder, on current showing it would have to be the Explorer. Took my boat on some moving water yesterday.Nothing major, just a nice flow with a few riffles. It reinforced my initial view that I've made a good choice of boat i.e. still felt nice and stable, tracked and manoeuvered fine. My friend Mangy Mutt who likes a bit of WW had a paddle also and was impressed with its abilities, but thought it may be a bit compromised in the rougher stuff. 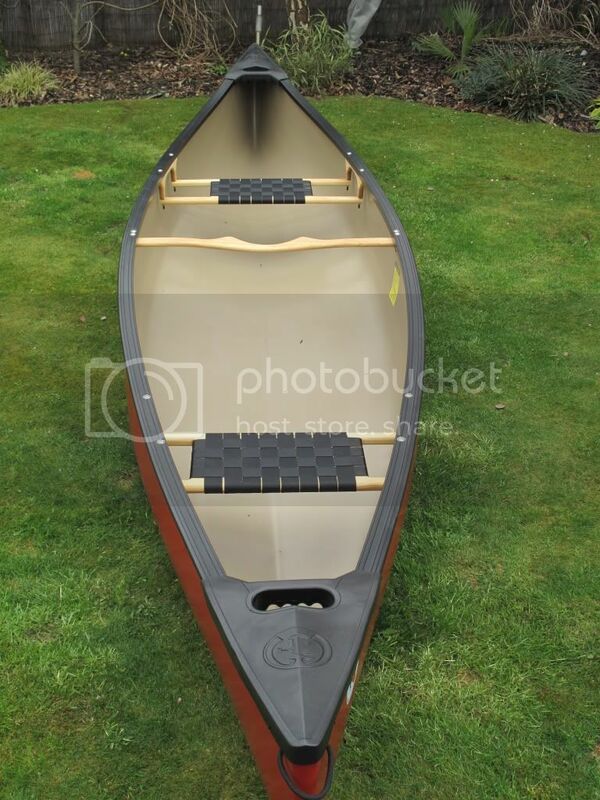 As I don't intend to paddle anything too rough, it'll do for me as a good all round boat. Just to reinforce my view so far, I have now paddled the boat tandem on flat water. 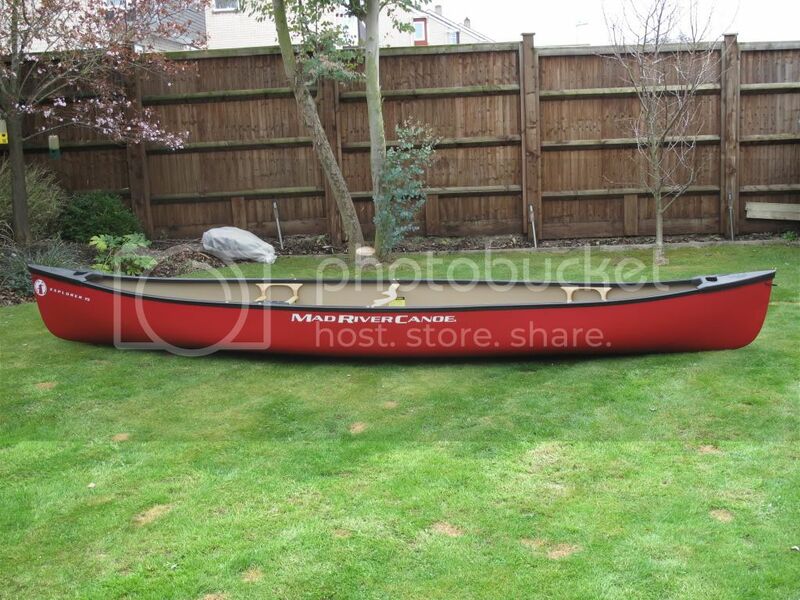 Not the fastest boat, but nice and stable and inspires confidence in those that have done little paddling (my wife).